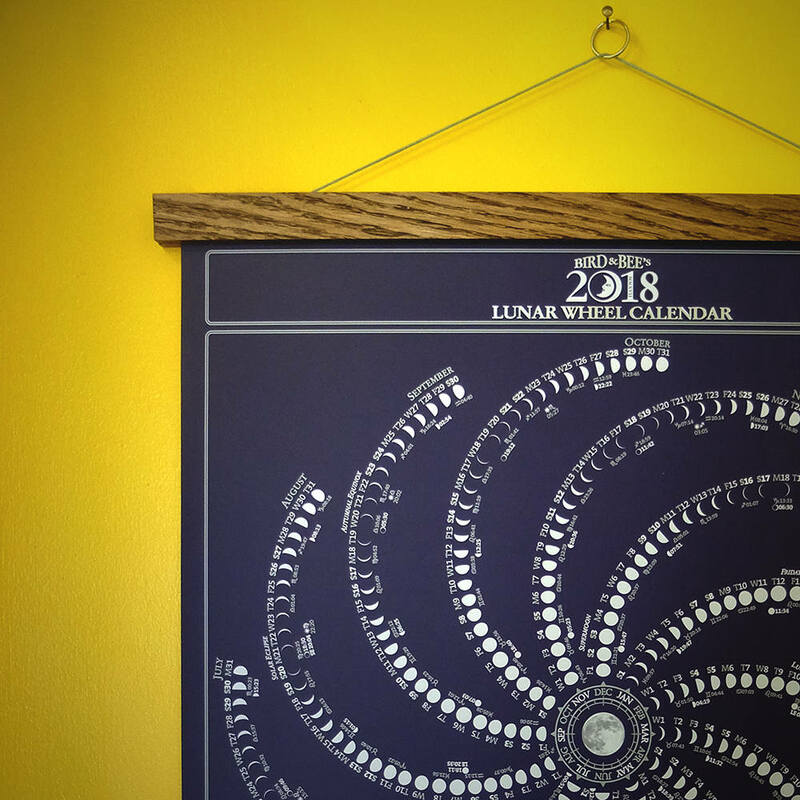 Bird&Bee’s Original Lunar Wheel Calendar that charts the phases of the Moon and includes Sunrise & Sunset times for all Sundays, Friday 13ths, Blue Moons & Super Moons and much much more. 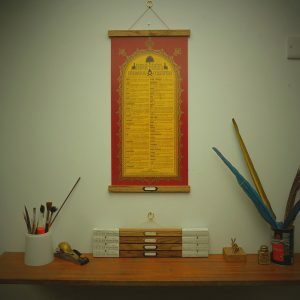 Now available with or without Bird&Bee’s Antique Oak Picture Hangers. 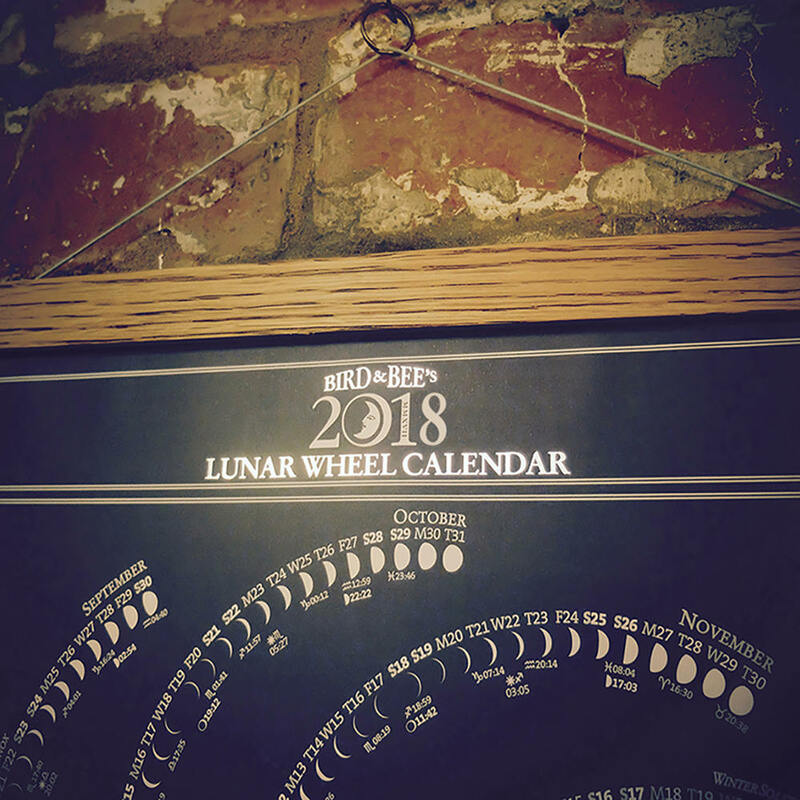 …we present Bird&Bee’s Original Lunar Wheel Moon Calendar (18th Edition) to guide you through the wax & wane of the year and help you tune in to the natural cycles all around us – the original and the best. 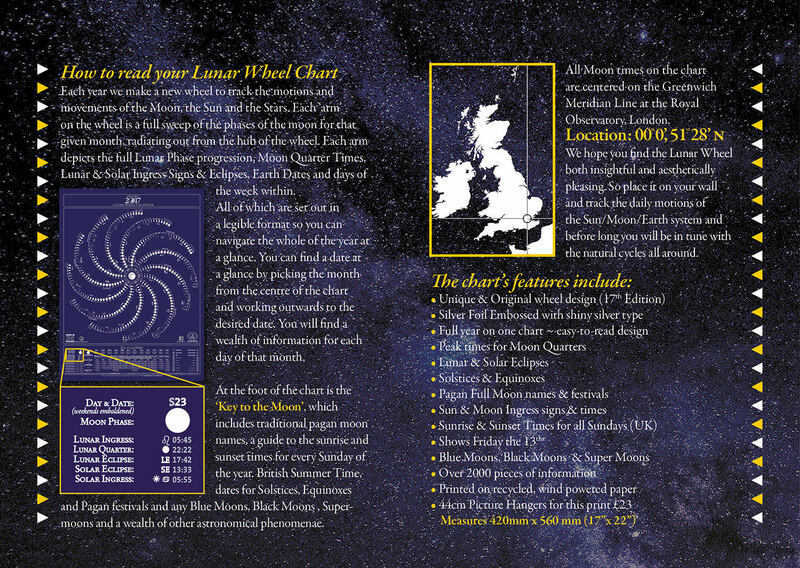 Each year we make a beautifully printed, new chart to track the motions and movements of the Moon, Sun and the Earth. 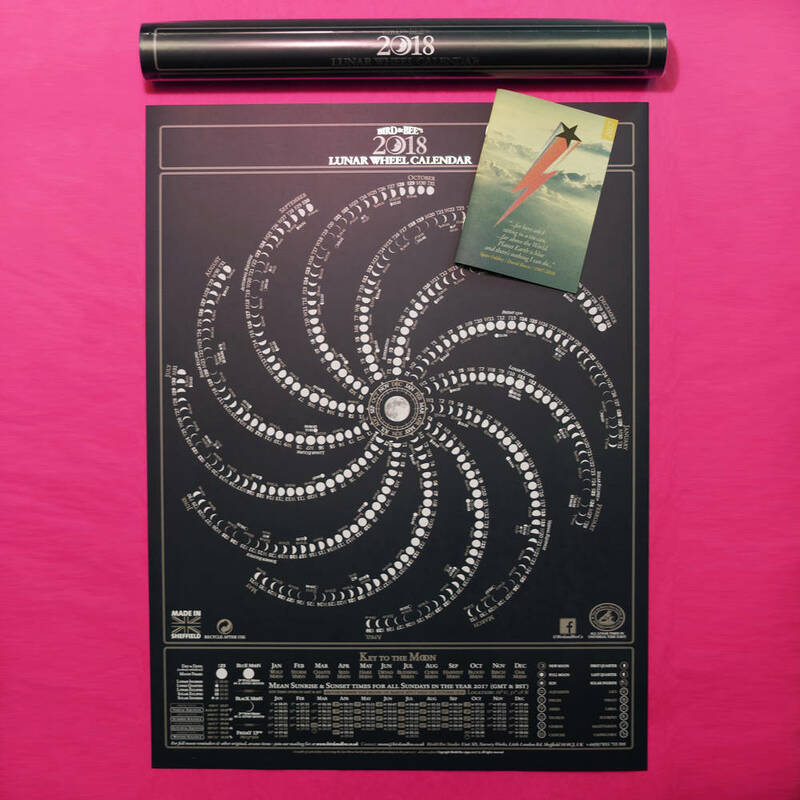 Each ‘arm’ on the wheel is a full sweep of the phases of the moon for that given month, radiating out from the hub of the wheel. 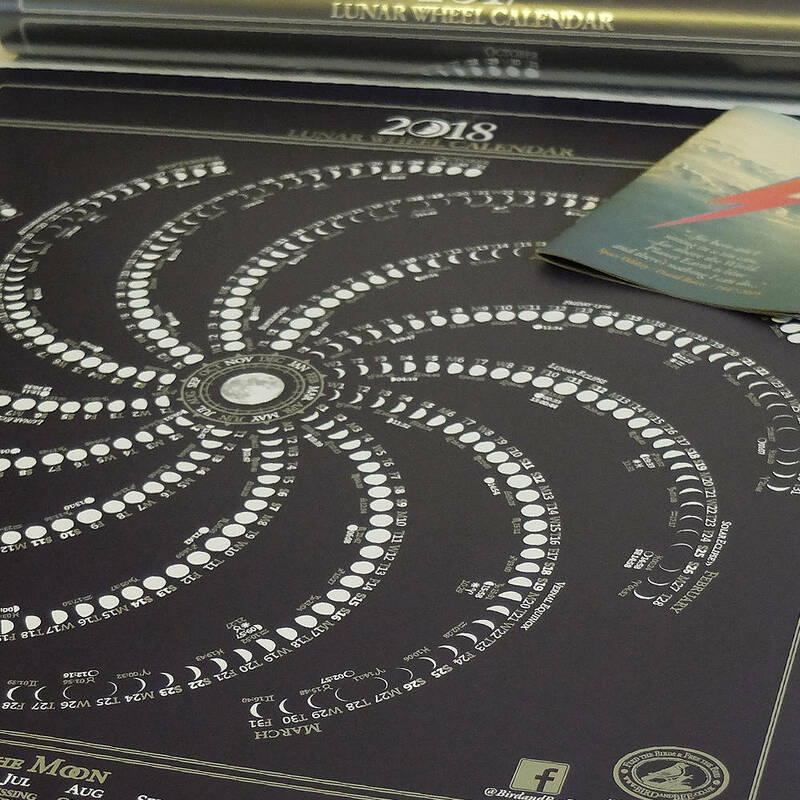 Each arm depicts the full Lunar Phase progression in Gregorian calendar format (standard 12 months). 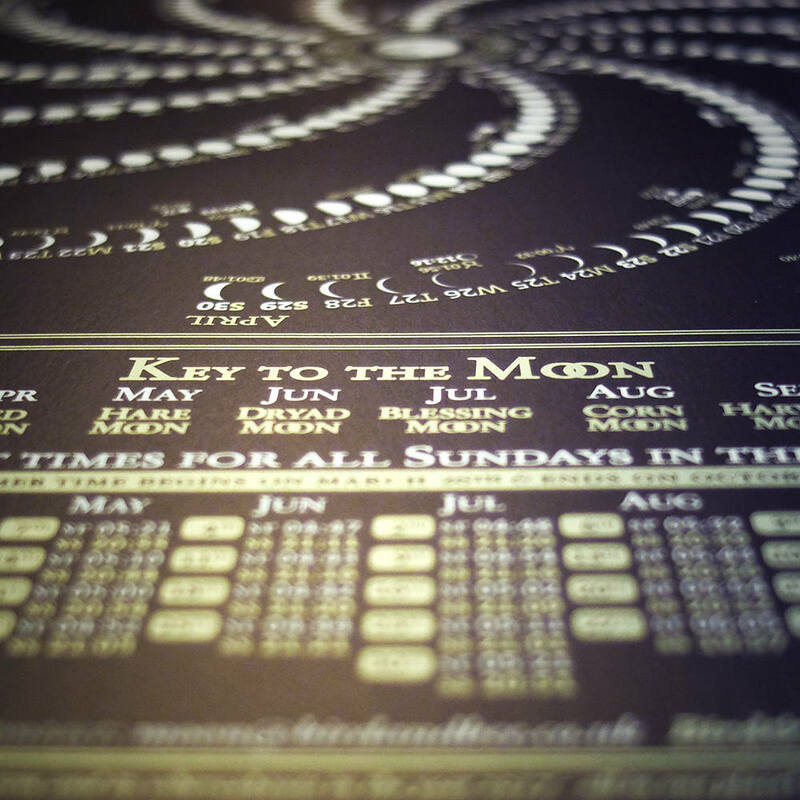 It shows Moon Quarter Times, Lunar & Solar Ingress Signs, Lunar & Solar Eclipses and Earth Dates and days of the week within. 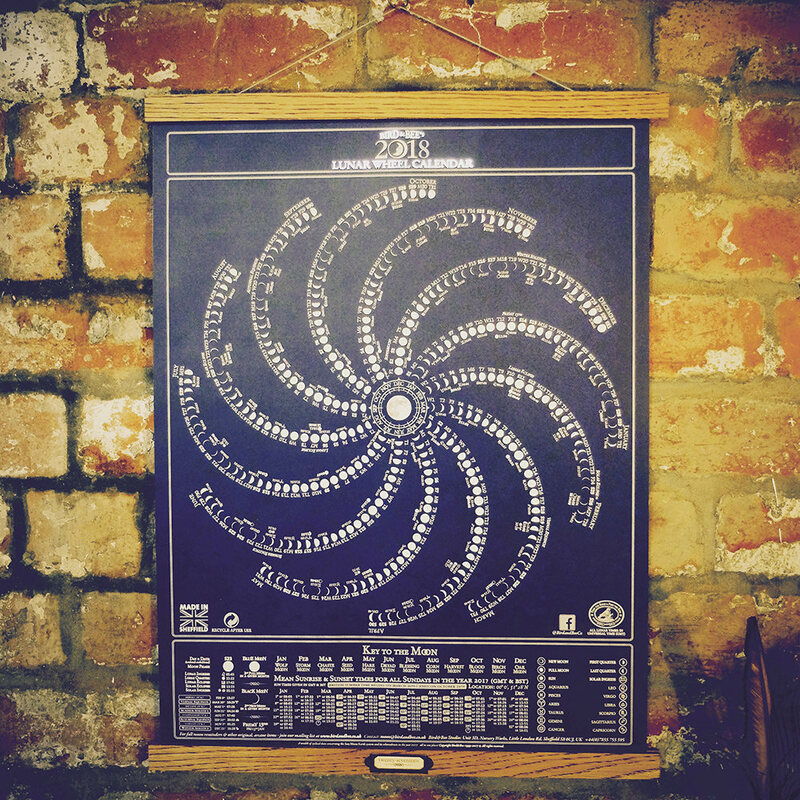 All of which are set out in a legible format so you can navigate the whole of the year at a glance. 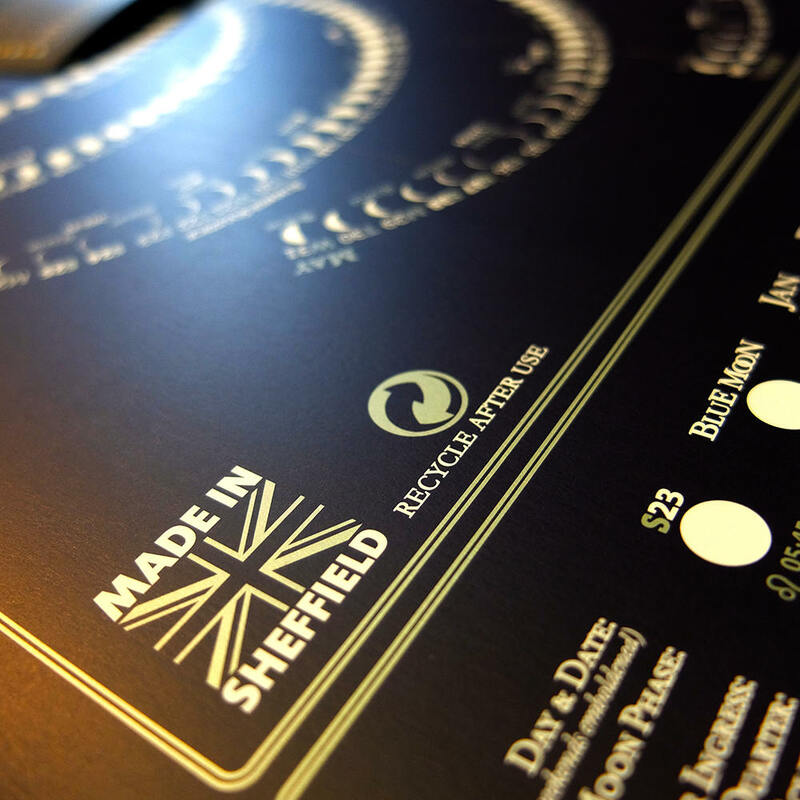 • A completely original design by Bird&Bee. 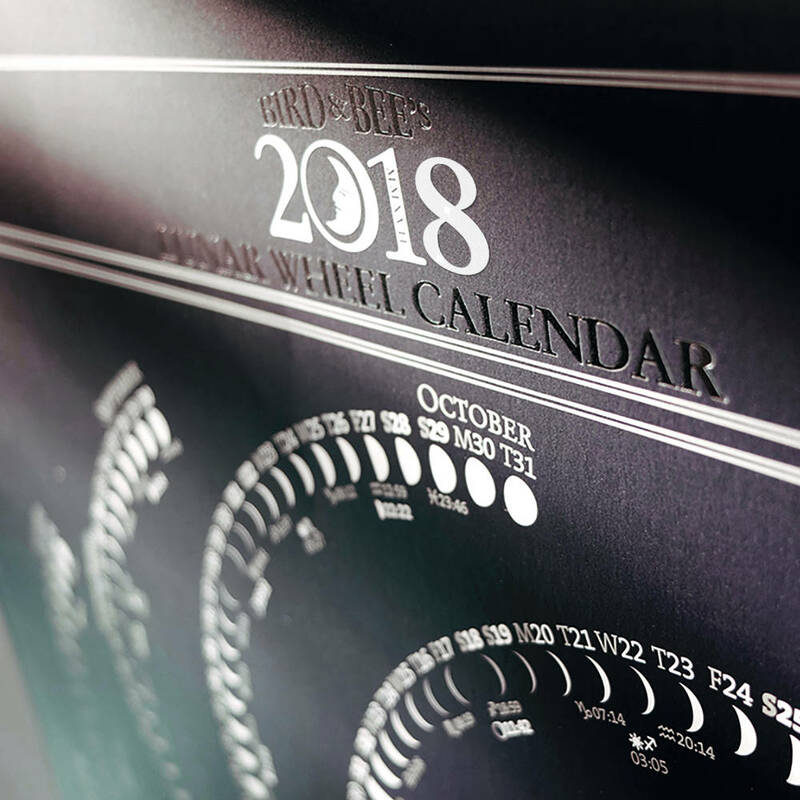 The information booklet explains all about the Sun, Moon, Earth system, what ephemera to look out for during the year, folklore, astronomical phenomena and lots more. 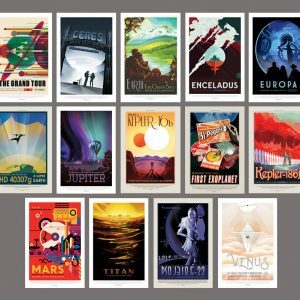 Try one today, get tuned in to the natural cycles in our planetary system and support the change you want to see in the world. 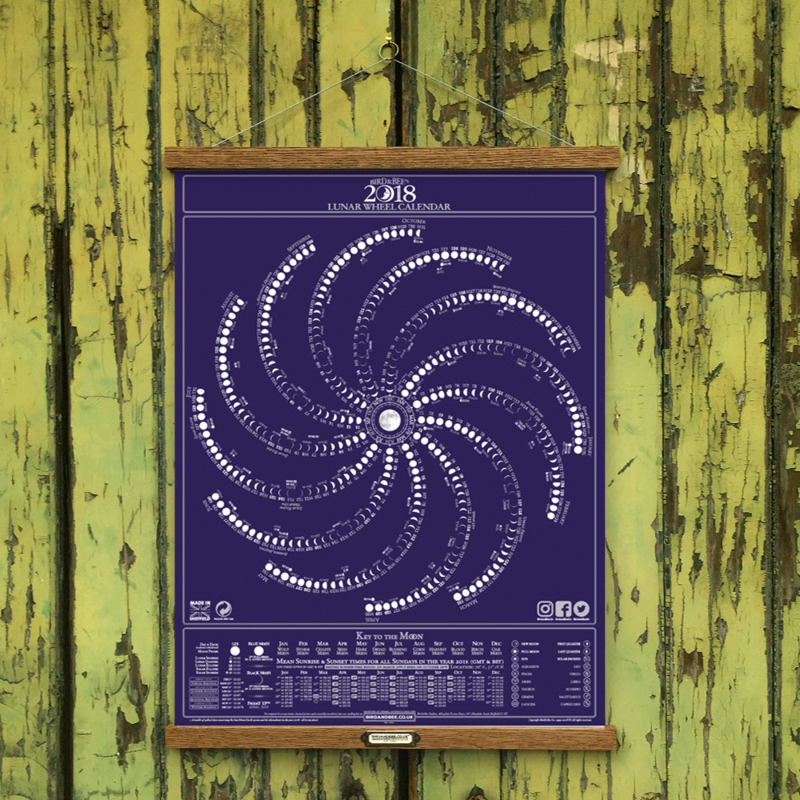 • Hangs in seconds, lasts for years • Reuse with any print or next years calendar. 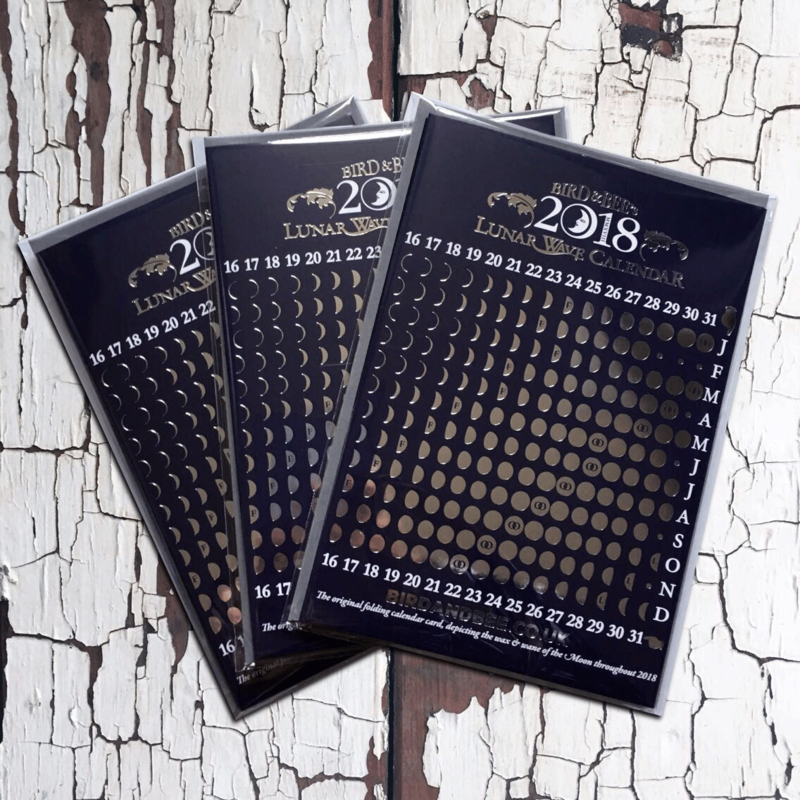 • Bespoke Ivory Label depicting Calendar year.